Lutz Rath performs Kurt Schwitters (1887-1948) -- his "Ursonate" (1922-32) -- with voice and cello, creating an extraordinary new approach to performing a foundational work of "sound poetry." Performed at White Box in NYC on August 26, 2010 in a program with an "axial composition" by David Arner, George Quasha, and Charles Stein, also online here. Curation by Juan Puntes. Camerawork by Susie Lim. Video editing by George Quasha. 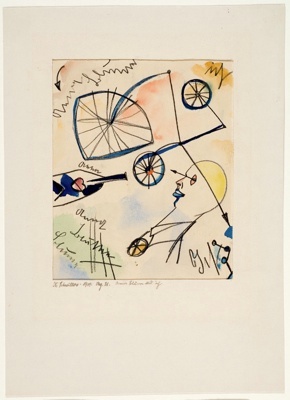 The work has been performed at various speeds (Schwitters' own performance, audible online, is not one of the fastest). Lutz Rath performs only a part of the work for around 13 minutes, whereas typically a full performance lasts 45 minutes. He also combines cello (spontaneous composition) with a more formal spoken performance of a part of the text. This could become a new way to perform Schwitters. 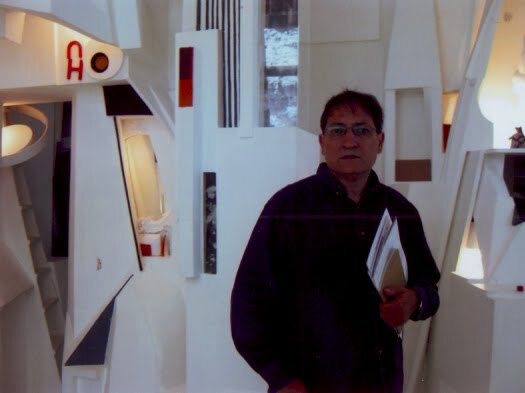 The title has been translated "Originary Sonata" or "Primal Sonata." The text/sound poem was influenced by Raoul Hausmann's poem "fmsbw" which Schwitters' heard recited by Hausmann in Prague in 1921. 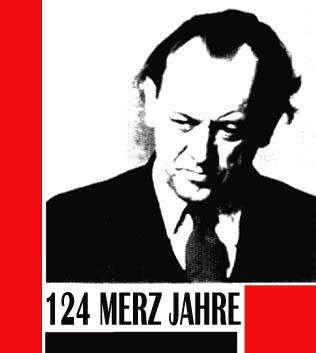 Schwitters often performed the piece, developing it over time, and eventually publishing his notations for the recital in the last Merz periodical (1932). 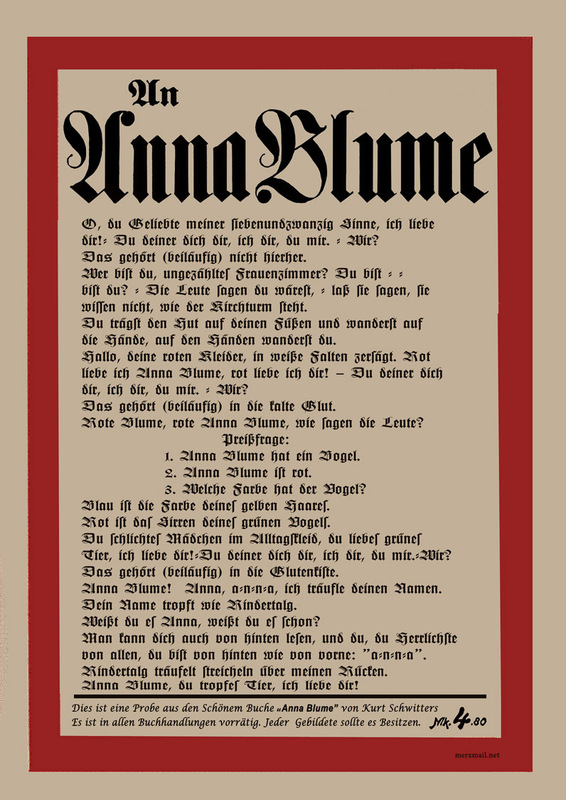 Desde el 15 de mayo en el Sprengel Museum (Hannover) está la exposición "Anna Blume y yo", con obra inédita de Kurt Schwitters, dibujos y trabajo sobre papel. 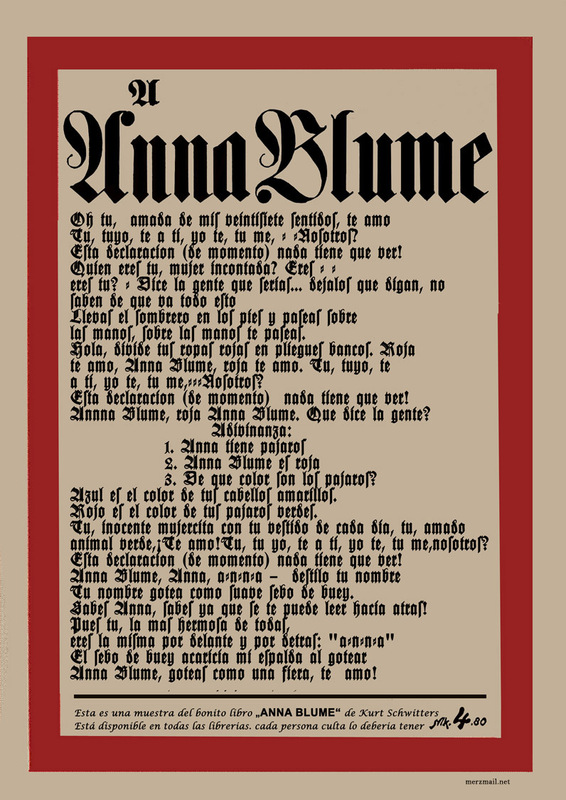 versión más o menos facsímile en castellano del cartel de promoción del libro ANNA BLUME de Kurt Schwitters, con letra lo más parecida a la original, en este caso Becker Fraktur. 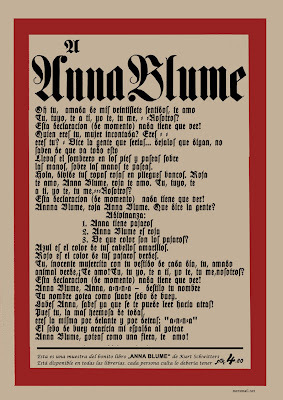 "Esta es una muestra del bonito libro "ANNA BLUME" de Kurt Schwitters. Está disponible en todas las librerias, cada persona culta lo debería tener.